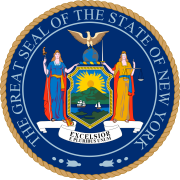 The 1883 New York state election was held on November 6, 1883, to elect the Secretary of State, the State Comptroller, the Attorney General, the State Treasurer and the State Engineer, as well as all members of the New York State Assembly and the New York State Senate. Besides, a constitutional amendment to abolish contract labor from the state prisons was proposed and accepted with 498,402 votes for and 269,377 against. The Republican state convention met on September 19 at Richfield Springs, New York. Elbridge G. Lapham was Temporary Chairman until the choice of Warner Miller as President. The incumbents, Secretary of State Joseph B. Carr, Comptroller Ira Davenport, State Engineer Silas Seymour and Attorney General Leslie W. Russell, were re-nominated by acclamation. Pliny T. Sexton was nominated for Treasurer on the first ballot (vote: Sexton 260, Ethan Allen 215). The Prohibition state convention met on September 26 at Syracuse, New York, and nominated Frederick Gates for Secretary of State, Stephen Merritt for Comptroller, James Baldwin for Treasurer, George A. Dudley for State Engineer and Virgil A. Willard for Attorney General. The Democratic state convention met on September 27 at Buffalo, New York.